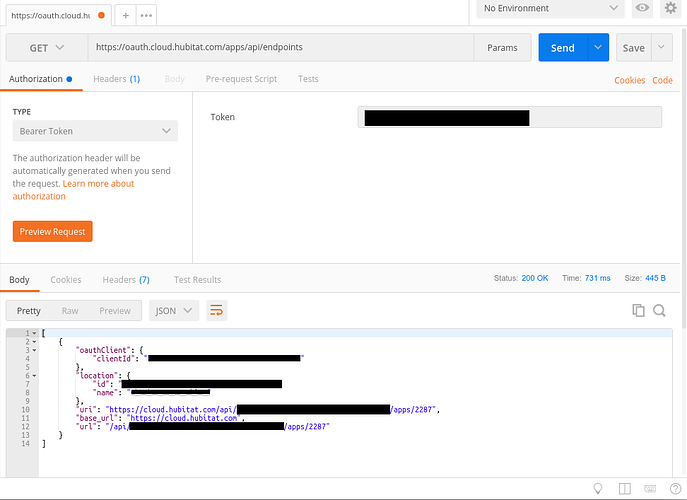 I haven't see much documentation on gaining an access token without using createAccessToken manually in an application, so I did some researching and poking around into the local and cloud endpoints using the ifttt integration urls, and subbing in some of the urls and variables seen on ST. Enabling oauth in your application. redirect_uri=server url that will accept the code. In this case I'm using localhost so I can just grab the code when it returns. The next screen will give you the option to either grant or deny the request and to set any devices you wish to give the app access to. You must have at least one preference in here to keep it from erroring out. Once you click authorize you will be given the code in the url. Keep note of this. This must be sent as a POST call using a tool like POSTMAN or curl. The response will be an access token in json format. See @chuck.schwer's post below on getting the app endpoints from the cloud. Also, for the call to /oauth/token, "hubUID" param does not need to be passed. it is not used in that particular endpoint. Thanks! I've updated the post. I had that param come back from my ifttt flow inspection, but it might have been an artifact of my hub selection. @chuck.schwer I just noticed that if you already created an accessToken using createAccessToken in the app, the new auth tokens generated with this method do not work and return an <error>invalid_token</error> oauth error. Can this be changed so that the new tokens allow access to the app? i swapped multiple notes with a member of the staff to gather this info in parts, so it is awesome that you summarized it so beautifully here. Thanks so much. We currently treat access tokens and bearer tokens differently. We did have a discussion about treating bearer tokens the same as access tokens but it has not been implemented. So currently you have to pass access tokens in the url as a parameter and a bearer token in the headers as an Authorization header. You can use both of them for the same app but the way to create them is different. Is there a way to get the endpoint of the app using the local oauth service on the hub? Mostly just for the app id since you have to know the ip of the hub to start with. Thanks! I tried it before posting but just realized I misspelled something in the url. I'll add it to the post. The local OAUTH flow version stopped working for me after I updated my hub to 2.0. Anyone else having this issue? curl http://192.168.0.55/apps/api/endpoints -H "Authorization: Bearer <token>"
In case anyone stumbles upon this old thread, this problem has been fixed some time ago. At least, I'm having the same issue/symptom. 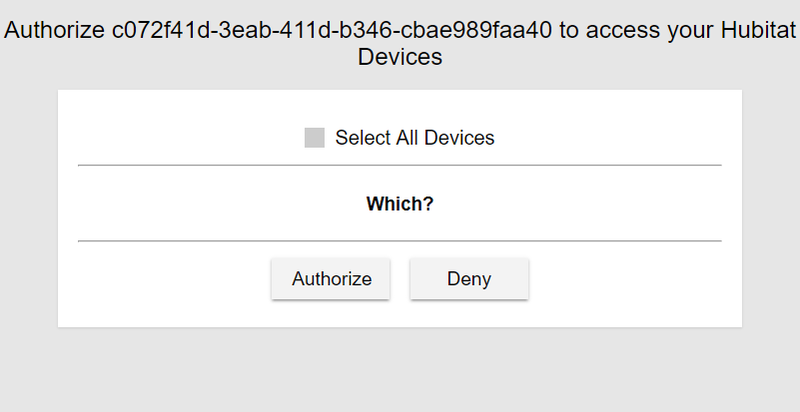 I'm working on getting my Ecobee Suite ported over once and for all, but even though the initial login returns the correct information (the same state variable I sent AND a valid authorization code for api.ecobee.com), I ALWAYS get this same invalid_token error. It appears that api.Ecobee.com isn’t returning the provided access_token on its response to my initial authorization call - the error says invalid_token, with the word ‘null’. If I add “&access_token=“ to theURL in a browser, it proceeds further, only to return an error 500. 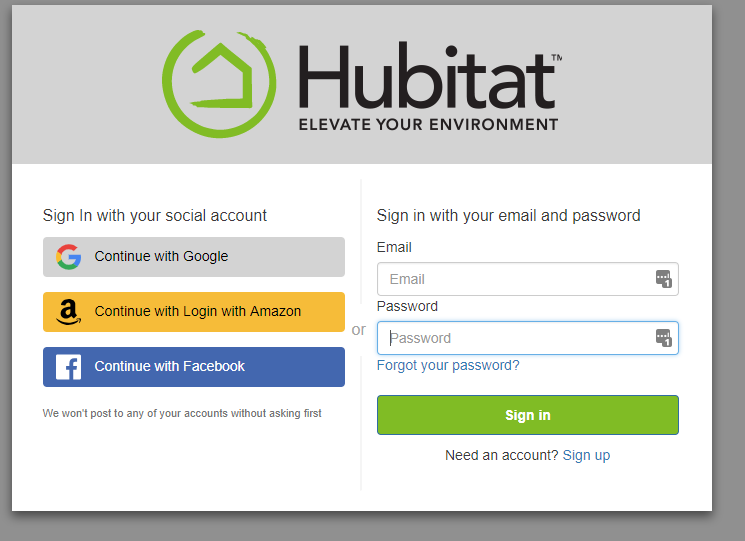 All this works from SmartThings, but I know the process is a little different for Hubitat. I just don’t know how to coerce the expected response out of Ecobee From the Hubitat platform. You might want to get in touch with @mattw ... he ported your Ecobee Suite (v1.4?, but not the helpers, I think) early last year. I'm using that version with HE at one location; it's been working fine for almost four months now. I would prefer to avoid the Pin authentication route if at all possible - I prefer not to maintain the two versions using different authentication methods.